I have a few favoured restaurants in Vancouver where, on a cold winter’s night, I can find reliable comfort food. On Friday, I was rewarded after a ten-kilometre cycle in the cold with an excellent serving of Bouf Bourguignon at Burgoo on Main Street. Saturday night, I enjoyed a similar meal of meat and potatoes, this time of the musical kind. 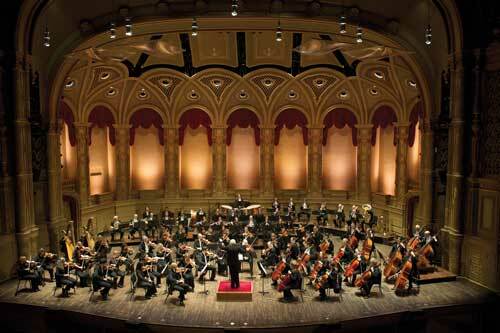 Here’s what I heard on the Vancouver Symphony’s Masterworks Gold programme: three warm familiar works by established masters in the cozy glitter of the Orpheum theatre. And, of course, the Sensational Midori! The story of Tristan and Isolde (or Tristram and Iseult) is an archetypal Celtic saga dating from the Dark Ages and coming to widespread popularity in the era of courtly love during the high Middle Ages. It’s a tragedy about a Cornish knight, Tristan, charged with shipping an Irish princess, Iseult, home to her husband, King Mark (Tristan’s uncle). On the voyage, the two consume a love potion, fall in love, and the ensuing chaos and hilarity concludes with the pair finding themselves dead. But wait! It’s Wagner so that means it’s going to take four agonizing hours of unfulfilled and misleading harmonic resolutions before the inevitable can occur. Thank heavens, we heard only the overture. Through the eyes (and ears) of the 21st century, it’s still impossible to assess Wagner outside the horrors of the 20th Century (he was a notorious anti-Semite and his music was further besmirched as a weapon of propaganda by the Nazis). If you’re able to strip away that century, and indeed the 19th century with it, you might hear the ancient saga in its original—this music conveys not only enormity of emotion but also the awe of deep time. The slowness with which phrases unfold telescopes you back to that small lone ship somewhere in the Irish Sea, heaving on the waves and far from shore. Sustaining that sense of timelessness, however, was no small matter and this performance was bedevilled with shaky wind entrances and acoustical challenges, such as accompanying horn entrances sticking out from the fabric when they should be blending into the overall architecture of the music. Yes, the acoustics at the Orpheum are pretty good, but they’re not great. Still, the Liebestod (Lovedeath) theme swelled and crashed on the rocks with salty splendour, much credit to the rich and sumptuous ensemble work from the strings. At first it seemed that programming the Shostakovich ahead of the Brahms (tradition dictates overture, concerto, followed by symphony) seemed like a calculating marketing choice (I mean, would the adoring Midori fans stick around for a thorny Shostakovich symphony after swooning to Brahms? ), but on hearing it all run together, the order indeed seemed appropriate. Shostakovich’s teenage symphony (composed at just 19) is fun; it’s brash; it’s clever. But were it not positioned between two mature works by great masters, I think it would read like a hipster on a skateboard­—all shits and giggles and no substance. The symphony, while following the usual four-movement model, is something of a concerto for orchestra. Almost every part of the orchestra is in the spotlight at some point, so notable mention should go to concert master, Dale Barltrop (violin); timpanist, Aaron MacDonald; and flautist, Christie Reside for some truly excellent solo work. To the extent that acoustics failed the Wagner, they succeeded in the Shostakovich. Despite the tendency for the ends of phrases to disappear into oblivion (thanks again Mr. Orpheum), the orchestra’s bright and crystalline sound ensured the work’s kinetic energy crackled right to the last sucker punch. The Brahms concerto is often billed as the Mount Everest of concertos for violin, but you’d never know that to listen to it. It doesn’t fit the paradigm of striding soloist ahead of an obedient orchestra. Like much of Brahms, this concerto is a fine conversation among equals. I was prepared for sensational violin playing from Midori (30 years on the stage and generally recognized as one of the top-ten living violinists), but I wasn’t prepared for the sudden hush over the audience that greeted her entrance. She breathes confidence. To master this concerto, confidence is a must, but so is humility and surely Midori was selected as a UN Messenger of Peace for more than her fiddle playing alone—where she goes, the world is a better place. The very congeniality of this concerto fuelled some of Brahms’ detractors, such as Pablo de Sarasate who refused to play it on the grounds that he didn't want to "stand on the rostrum, violin in hand and listen to the oboe playing the only tune in the adagio”. The oboe solo, incidentally, was delivered in this performance to perfection by principal oboist, Roger Cole, and in fact the entire orchestra seemed to rise to the occasion—Midori’s confidence is infectious. The end of the first movement features an extended cadenza for solo violin in which she showcased equal measure of virtuosic brilliance and miscible refinement. At the end of the cadenza (Midori played the one written by Brahms’ friend, Joseph Joachim, the violinist who premiered the work), she handed off the reigns to the orchestra, which they accepted brilliantly—possibly the highlight of the evening. I love it when that happens. If you missed this performance, you can catch the reprise Monday, January 14, 2013, 8 pm at the Orpheum Theatre.